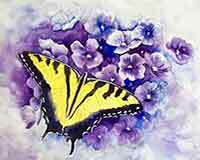 One of my great joys is doing butterfly paintings! Since retirement there is more time for gardening. Many of my flowers attract butterflies. When I see these gorgeous creatures I snap reference photos for more paintings. Let your imagination fly away as you enjoy the butterflies! The "Tiger Swallowtail Butterfly" is quite large. You can't miss it. There is the eastern version and a western version. Sometimes the females are brown. There are lots of types of swallowtail butterflies. There are lots of types of swallowtail.butterflies. The Monarch Butterfly is the most well-known butterfly in the United States. Daisies have been my favorite flower ever since I was a child. 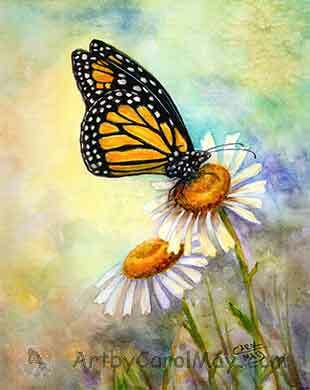 It was a joy putting these two favorites together in "Monarch On Daisies". I had the privilege of seeing large numbers of Monarchs in Mexico on their migration route. Last year I had lots of them come to the Butterfly Weeds in my flower garden. The caterpillars ate their fill, metamorphosed and took off on their amazing journey. My flower garden attracts butterflies. I try to include native flowers in the garden whenever it's possible. The butterflies and I both enjoy them. 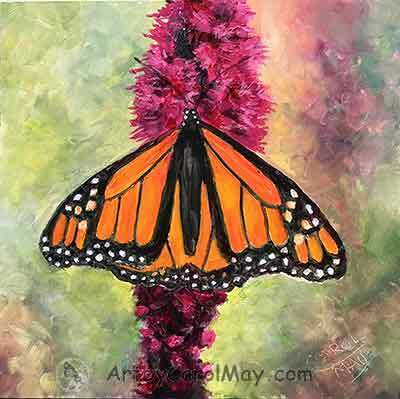 Here is a "Monarch on Liatris" a native wildflower in the central part of the United States. This painting is done with oils on Gessobord. The "Buckeye Butterfly" is a dark colored butterfly with its big eye-spots. It is a frequent visitor to many yards. I photographed it when I saw it on my white daisy Chrysanthemums. 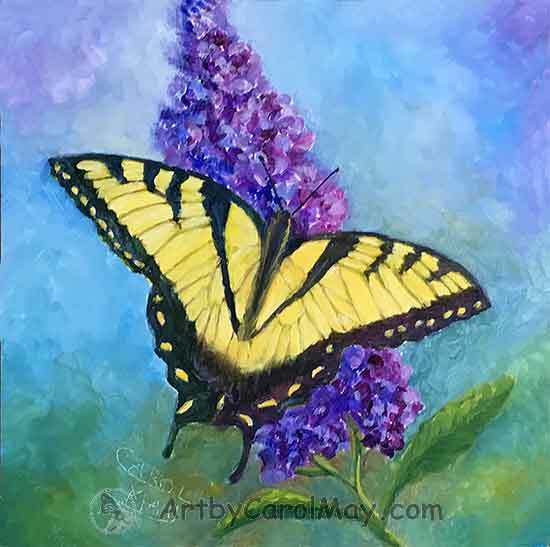 It made such a beautiful contrast that I wanted to do this butterfly painting. It is painted with the mixed media method I explained on the how to make Awesome Paintings page. The original painting is on a sturdy 11x14" archival Aquabord manufactured by Ampersand. When the painting was thoroughly dry I sprayed it with a UV resistant coating that seals the watercolor paint. Traditional watercolor paintings on paper have to be matted and framed under glass. This painting can be framed without any glass. 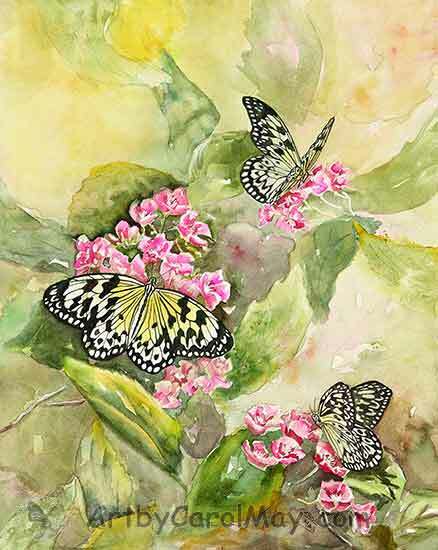 This one of my favorite butterfly paintings. The original painting is available. I saw these "Large Tree Nymphs" butterflies at the Butterfly Rainforest in Gainesville, Florida. They were feeding on False Hydrangea flowers. They are from SE Asia. 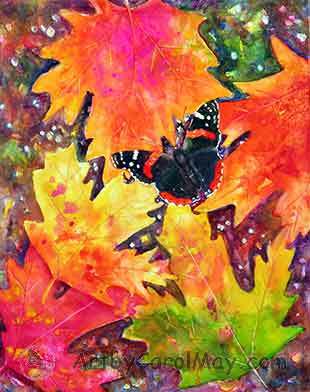 I painted some of the leaves flying to mimic the flight of the butterflies. Is is lots of fun as well as educational to go to butterfly gardens. If you have a butterfly garden near you, I recommend a visit. We all enjoy the springtime after a long winter. My lilacs were blooming and when I walked across the lawn I saw these lovely little Azure Blue Butterflies. The "Little Blue Butterflies" are only about three-quarter to one inch wide. 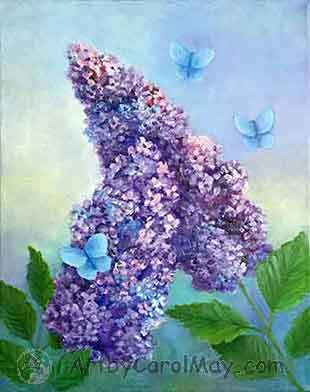 Since the lilacs and the butterflies both showed up at the same time, I put them together in the same painting. This oil painting is on gallery-wrap canvas. I always keep my eyes out for butterflies. I only had the privilege of seeing the "Red Admiral Butterfly" a couple of times. Both times I saw them on the ground among the leaves and grass. So I painted it on some fall leaves to complement its beautiful red bands. The "Giant Swallowtail Butterfly" is amazing to me not only because it is a large butterfly, but because of the color change from the top side of the wings to their underside. If you see the different sides of its wings at different times, it is hard to realize it is the same butterfly. The underside of the wings are mostly pale yellow with black markings. The topside is a stunning brilliant black and yellow. 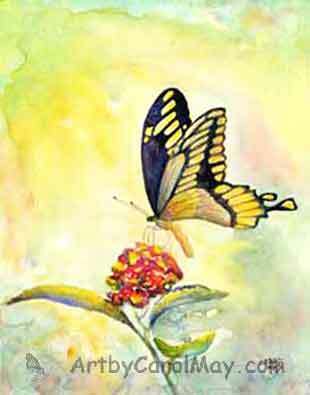 This is a watercolor butterfly painting with him sitting on a Lantana flower. It was a cold January day in Florida. 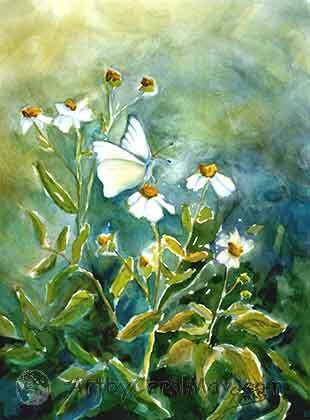 I was surprised to see these lovely little "Southern White Butterflies" flitting around the roadside daisies. The Spanish Nettle is sometimes called the Beggar's Weed because it makes seeds that stick to your socks when you walk thru them. Daisies are one of my favorite flowers. They are a favorite for the butterflies, also. They provide lots of food for the butterflies and they have a landing pad for the butterflies to sit down while they eat their fill. My husband and I drove to central Florida to see the Whooping Cranes that had arrived for the winter. While we were out walking around I saw this lovely butterfly. What a treat to see the "White Peacock Butterfly". 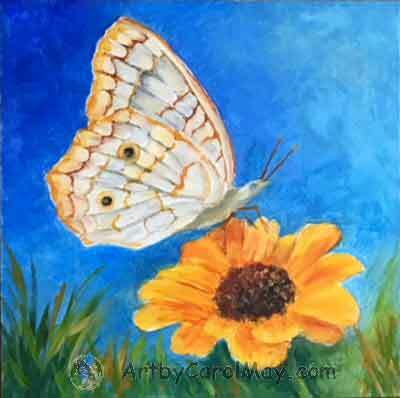 This is an oil painting with the butterfly visiting a Zinnia flower. 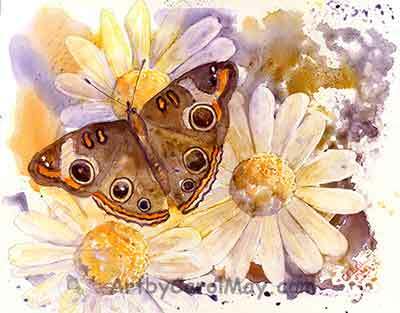 Butterfly paintings keep me on the lookout for new butterflies. One day my husband and I saw a bunch of these butterflies on the Pickerel flowers beside the boat ramp. They were "Spicebrush Swallowtail" butterflies. 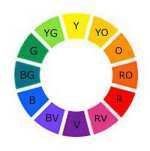 This painting is done with Casein paints. Do you see the image of another butterfly in the background? 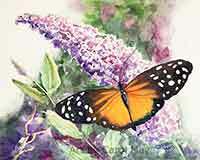 It is a joy doing butterfly paintings. The joy is for you to share, too. Fine Art America makes prints from my original paintings. You may get prints on paper, wood, canvas or even metal. They also have a variety of phone cases, notebooks, beach towels, etc. with my paintings printed on them. Check it out. You are sure to find something that you would love to have in your home. 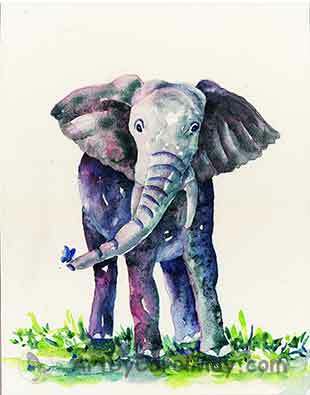 A butterfly surprised the elephant. 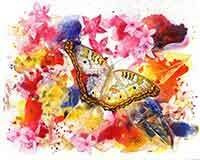 Step-by-step tutorial of Painting Butterflies. 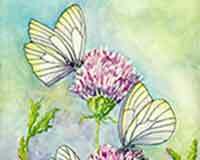 Learn Watercolor and paint a Butterfly.